I have never been a literary critic in the true sense. This no doubt has much to do with the fact that by profession I am a Bible scholar and theologian, with literary interests only a hobby. Few of these studies attempt to expound Lovecraft’s literary techniques. The reader will readily see that my focus is on the underlying concepts of Lovecraft’s fiction. In but one article have I sought to set forth Lovecraft’s philosophy of existence and how his fiction is a parabolic, almost didactic, depiction of it. This vitally important aspect of his thought has been thoroughly and enlighteningly covered by Dirk W. Mosig, S. T. Joshi, and Donald R. Burleson. Rather, my concern has been, first, with currents of religious, philosophical, and occult thought that Lovecraft used as raw material for fictional purposes. We may better enjoy stories which employ these concepts if we better understand what Lovecraft had in mind. Second, I have been interested in fine points of exegesis, to research specific intriguing allusions in Lovecraft’s fiction, many of which have religious roots. Third, I have been most fascinated with what Lovecraft called his pseudomythology of Cthulhu and Yog-Sothoth. This is what we call the “Cthulhu Mythos” (though this terminology has been hotly debated for some years now since some feel it has been irreparably tainted by the association with distortions of Lovecraft’s original concepts). HPL attacked the task of developing this mythology with all the ingenuity a genuine hoax would require, so as to make it all truly convincing to a reader whose disbelief the author hoped to suspend. He did such an exemplary job of it that the resulting body of pseudomythical lore has attracted the efforts of others to explicate, systematize, and debate as if it were a genuine sectarian theology. I am one of those. Real theology and mythology are my business; Lovecraft’s pseudo-religion “Yog-Sothothery” is my hobby. The present essays, then, principally attempt to trace out the contours of Lovecraft’s thought as it underlies whole stories, large groups of stories, or very pointed details mentioned in passing. Some attention is given to his own life, sometimes as reflected in his fiction, sometimes not. H.P. 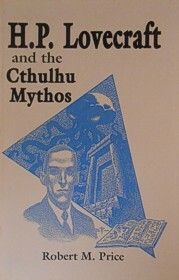 Lovecraft and the Cthulhu Mythos. By Robert M. Price. Mercer Island, WA: Starmont House; 1990; ISBN 1-55742-152-8; paperback; 174 pages.